Are you going to be a new kid on the block this school year? No, I’m not asking if you joined a singing group, I mean are you moving to a new school or is this your very first teaching job? If so, I’m sure you’re busy downloading lessons, making centers, and visiting all of the thrift stores looking for books to fill your class library. I don’t want to add to your plate, but . . . I have a few more things you might want to add to your “to do” list or maybe it’s a “to think about” list. 1. School districts usually adopt a specific handwriting program such as D’Nealian or Handwriting Without Tears. Before you begin making posters and other things for your classroom, find out which program your district uses. 2. Some district will provide an ABC strip for your class like this one. Other school districts expect you to make one or buy one. Make sure you use the correct font (D’Nealian, Handwriting Without Tears, etc.) if you purchase or make one. 3. If you are very lucky, your PTA will give you money at the beginning of the year to purchase things for your classroom. Ask your mentor if you are in such a school and what the procedures are for getting reimbursed. Ask your mentor; don’t assume your PTA will do this. Each PTA is run differently. 4. Save, save, save! Save your receipts. If you are going to get reimbursed by the PTA, you will need receipts. Save all of your other school-related expense receipts for April 15th. Work related expenses are tax deductions. Click here for more info. 5. If you have small children, I highly suggest you have a “Plan A” babysitter and a “Plan B” babysitter. You know Murphy’s Law . . . if anything can go wrong it will, this is exactly why you want a Plan A and Plan B babysitter. It never fails, it’s the morning of your first day of standardized tests, your husband is out of town, your Plan A babysitter calls to tell you that she’s sick and can’t watch your baby today, what do you do? Ol’ Murphy is knocking at your door! But, if you have Plan B, you can kick Murphy down the road. 6. There will be days when you are amazed that you got to school with two matching shoes. Although, I must admit I’ve gotten to school with a blue sock and a black sock. How embarrassing! When you are having a Murphy morning, it is very easy to forget to bring your lunch to school. Have you seen those tuna and chicken salad snack packs? Buy a box of those and keep them in your closet to combat those Murphy Mornings. 7. Every teacher needs an Emergency Kit. I keep mine in a rubbermaid box. In my box are useful things such as: jumbo bottle of Tylenol for the occasional headache, cold medicine, cough drops (you will talk so much that you might get laryngitis), spray for static cling, clear nail polish (if you wear hose or tights in the winter), safety pins, sunglasses, nail clippers, hair barrette/ponytail holder, bandaids (for blisters), hairspray, brush/comb, deodorant, toothbrush/paste, dental floss, change for vending machine, and baby powder. Baby powder works great if you work in a tropical place with no air conditioning. It absorbs sweat and makes you smell good. I also keep an extra pair of shoes and socks at school. You never know when one of your students will throw up on your shoes or you step in a cold, slushy hole on your way into school. It’s best to be prepared! I wrote a post about it. Click HERE to read it. 8. Most doctors will tell you there are two things teachers are known for: varicose veins because they stand on hard floors all day and chronic U.T.I.s because they can’t use the restroom often enough. Use the restroom every chance you get. Just like we tell our kids, go to restroom when you have a chance and try even if you don’t think you need to. Follow this advice so you won’t be a part of your Doctor’s frequent flyer program. 9. Be prepared to have sore feet. Invest in good quality shoes, your feet with thank you. On Proteacher, there was a discussion of which brand is the most comfortable. Also, try switching shoes at lunch time. I don’t know why switching shoes helps your feet, but I’ve had good luck doing this. I’ve also seen teachers who wear slippers like these (below) at school. But, check to make sure it’s allowed at your school before you spend money. **Arrival: Where do you pick up your class? **Specials: Do you walk your class to P.E., music, and art or do they come to your room? Are you responsible for some type of communication system such as a clipboard to take to specials? **Library: When do you sign up for library time? Do you stay with your class or can you leave? When can your students begin checking out books? **Lunch: What are the lunch time procedures? Assigned table / assigned seats? Do you line up your students in a certain order such as milk only, 1st choice, 2nd choice, etc.? Do you stay with your class or is it a duty-free lunch? **Email / Teacher mailbox: How often are you required to check emails and your mailbox in the office? **Nurse: Where is the nurse’s office and what are the procedures for sending a student to the nurse? **Recess: What are the school-wide rules regarding the playground? How often do you have duty? **Planning: Does your team plan together? Do you have team meetings? What lesson plan format is required? **Absent/tardy students: How do you report absent and / or tardy students? **Dismissal: How does your grade level dismiss their students at the end of the day? This may seem a little overwhelming right now. But, if you begin thinking about these things now, you will have a much smoother beginning to your year. Good luck! « You Know it’s Summer Vacation When . . . JORDAN!! 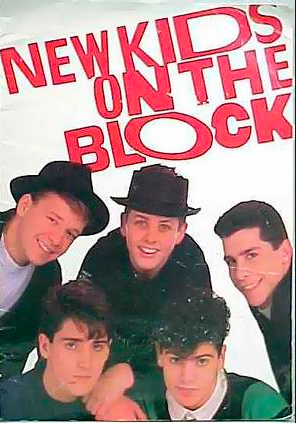 You had me at NKOTB lol! Great post for the newbies! Great post! It reminds me of some things I need to update for the next school year! I wish someone had shared this with me twenty years ago! Thanks so much for the info. I am "hoping" to have my first teaching job this fall. I've been thinking about some of these things, but hadn't thought of all you mentioned. This is a great list of things to remember. You know the RIGHT STUFF, BABY to keep teachers HANGIN TOUGH. They just need to take things STEP BY STEP!! Getting excited about my first year teaching! Thank you for all your wonderful advice. I bookmarked your post! THANK YOU THANK YOU THANK YOU!!! I am a NKOTB! I just graduated, and this year will be my first year teaching! I am BOOKMARKING this post! Thanks so much! Great tips for New teachers.